Close-up photograph of SCP-1209-1-1, demonstrating physical abnormalities caused by SCP-1209. Special Containment Procedures: SCP-1209-1 instances are to be contained in standard humanoid containment cells at Site-██. They are to be fed meals three times a day. SCP-1209-1 instances are to be allowed to submit requests for entertainment or comfort materials which do not compromise security, within reason, as a reward for good behaviour. Socialisation with assigned Foundation staff is allowed, and encouraged in order to improve psychological well-being, but instances are not allowed to come into contact with each other. SCP-1209-1 instances are to be questioned at regular intervals by Foundation staff, and their responses are to be recorded, in order to document any noteworthy events observed and further understanding of SCP-1209. These interviews are to be conducted twice daily, at approximately 0800 hours and again at 1900 hours, as well as any time at which an SCP-1209-1 instance requests such an interview. SCP-1209-1 instances which have observed potentially traumatising events are to be monitored by an assigned psychiatrist, but may not be administered amnestics. It is considered vital that SCP-1209-1 instances retain their memory of transmitted images in case this knowledge becomes pertinent at a later date. SCP-1209-2 instances are largely passive and do not present anomalous behaviour aside from connection to SCP-1209. As such, no containment procedures are required to directly deal with SCP-1209-2 instances aside from monitoring. However, efforts should be made to identify all SCP-1209-2 instances. Should any SCP-1209-1 instance observe an event which is considered pertinent to the Foundation's mission, the Site Administrator of Site-██ is to be notified immediately in order to discuss responses. Description: SCP-1209 is a congenital defect of the eye found in several individuals from the region of [DATA EXPUNGED], and believed to be caused by an environmental factor. As a result of the deformity, the eye’s internal structure is drastically altered, although the most noticeable feature of the condition is the presence of multiple irises, pupils, lenses and associated anatomical features on the surface of the eye. Number of lenses per sclera is typically between two and four. This condition is usually accompanied by complete heterochromia, where each iris is differently coloured. 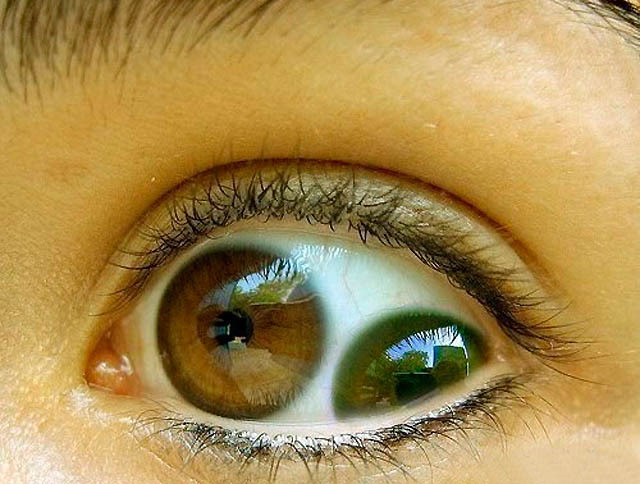 As a result of the presence of multiple corneas and a distortion of the sclera, sufferers report mild to severe discomfort when attempting to move their eyes, and some have only limited range of movement in one or both eyes. In many cases, deformities in the internal structure of the eye render one or more of the lenses partially or totally blind. An in-depth analysis of the abnormal optical structures found in SCP-1209 subjects can be found in attached document 1209-α. Individuals affected by SCP-1209 (henceforth referred to as SCP-1209-1) appear to be able to see normally through only one of the pupils, usually the one aligned closest to where the pupil would normally be located. All other pupils display a view of the world consistent with that seen through the eyes of other individuals (henceforth referred to as SCP-1209-2). Each pupil displays images as seen by a single, separate person, and the persons that each pupil is able to ‘see through’ appear constant at all times. Each SCP-1209-1 instance is connected to multiple instances of SCP-1209-2, as many as there are additional pupils. These connections allow SCP-1209-1 to experience visual stimuli only, and appear to only transmit through the left eye of SCP-1209-2 instances. SCP-1209-1 cannot perceive SCP-1209-2’s experiences when they close their eyes, or when their eye is damaged beyond the point at which SCP-1209-2 can see through them. Should SCP-1209-2 die, transmission of images will continue until the internal structure of the eye deteriorates to a significant degree due to decomposition. If SCP-1209-2 is permanently blinded, or if the SCP-1209-1’s additional pupils are damaged significantly, transmission of images will cease. However, defects in the additional pupils do not prevent transmission; only injury or trauma prevents transmission. SCP-1209-1 will continue to perceive the experiences of SCP-1209-2 while dreaming, although reported transmission is less complete than while awake. There appears to be a distinct correlation between SCP-1209-1 and SCP-1209-2, in that all SCP-1209-2 instances were born within approximately two hours of the relevant SCP-1209-1 instance’s birth. SCP-1209 was discovered following routine scanning of medical files at ███████ Hospital. Subsequent investigation led to the discovery of █ SCP-1209-1 instances born in the nearby area, centred on the town of ███████, and more specifically the main water supply of the town. Investigation revealed the possibility that an unknown chemical had been introduced to the water supply repeatedly over the previous ██ years by an unknown party, posing as maintenance workers in order to access the water supply network. Although this event is believed to have had some connection to the outbreak of SCP-1209 due to a correlation between periods of ‘maintenance work’ and conceptions resulting in SCP-1209-1 instances, it is presently impossible to determine whether the two incidents are related. All remainders of the compound believed to have been introduced into the supply had degraded into other chemicals before testing could be performed. No experimentation has been able to determine the exact cause of SCP-1209. ████ █████, Aide to ██████ █████, Secretary of State of [REDACTED]. Linked to SCP-1209-1-3. Considered noteworthy due to the considerable intelligence breach SCP-1209-2’s existence represents. As a result of Foundation intervention, Mr. █████ has since been removed from any position of political power. ███████ ████, a noted criminal operating as part of the central African militant group [REDACTED]. Linked to SCP-1209-1-2. Killed in combat action ██/██/████ Due to the graphic and distressing nature of transmissions from Mr. ████, SCP-1209-1-2 was been placed under psychiatric observation, and remains so despite Mr. ████'s death and the cessation of transmission. ███████ ███████, an Australian journalist working for ██████ █████ newspaper. Linked to SCP-1209-1-1. Killed ██/██/████ during an investigation involving material sensitive to Foundation interest, during which she witnessed the outbreak of the cognitohazard later classified SCP-████, though SCP-1209-1-1 was not affected. Remains to date the only use of SCP-1209 in order to assist Foundation efforts, as questioning of SCP-1209-1-1 was vital to providing intelligence allowing for the capture of the instance of SCP-████. Unknown individual linked to SCP-1209-1-3. Shortly after SCP-1209-1-3 came into Foundation custody, this instance of SCP-1209-2 is believed to have blinded himself in order to avoid detection. Prior to loss of transmission, the individual wrote down the message ‘I DON’T CARE FOR PRYING EYES. LEAVE ME ALONE’, apparently with the intention of transmitting the message to SCP-1209-1-3. It is unknown how or to what extent the individual was aware of his connection to SCP-1209. Unknown individual linked to SCP-1209-1-4. Careful analysis of data received from SCP-1209-1-4 indicates that no such individual was present, or could have been present, at some of the events described by SCP-1209-1-4. However, all descriptions of events relayed through SCP-1209-1-4 have proven to be accurate save for the appearance of the observing figure. Several events observed by this individual are extremely important or sensitive, although no transmission has been reported since ██/██/████.